Now that I have the car home, I have started the study process. That means you start stripping the body off and you walk around the car looking at all it’s naked bit and pieces. It is a voyage of discovery, and not always a good one. In this case it seems to be better than average. A couple of major elements I knew about before I bought the car. It needed a new carburetor and it needed an exhaust system. That adds about another thousand dollars to the cost of the car. As simple as this sounds, these pieces are not as easy to get as going to the store and buying them off the shelf. Especially the exhaust system. . The carb was actually that easy, thank goodness. Before I left on the trip to Langley I had been on the phone with Jim Schings at SR Racing in Lexington, Ky. The guys at SR are around the top of the short list of “go to” people when it comes to Formula Vee and Formula First racing. From them I ordered and new Bocar 34 PICT carb. It is the only one legal in he class. 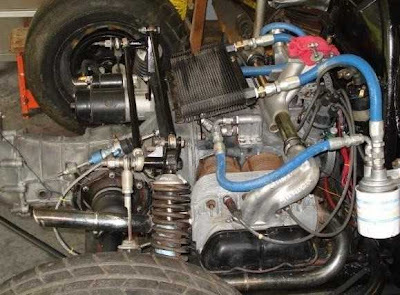 This had the advantage of not only being the legal carb but since I was getting it from them it would also have all of the required modifications done, and it would be flow tested and tuned to be at optimum performance. They would even set it up to run at its best in our very near sea level atmosphere. It had not arrived before I left but I wasn‘t worried. They had told me that it would take a bit because they do their flow testing on actual engines on the dynometer and no dyno test were scheduled for the next few days. From looking at the photos of the car supplied by David Rountree I knew that the intake manifold would also have to be replaced, so I added one to the order from SR. 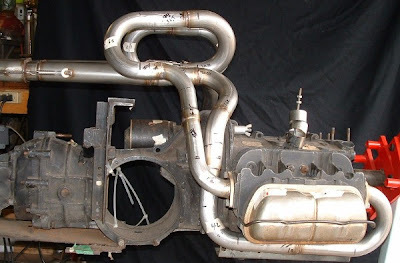 The manifold currently on the car was for a dual throat carb and would not work with the single throat Bocar. With these, I added the restrictor plate which is the equalizer for all the carbs in the class. The whole package arrived about a week after I got home. That left the exhaust system. I had already been down the lane with exhaust systems, trying to get one fitted for the Grinch. It still amazes me that something so simple should be so complicated and expensive, but boy is it ever. 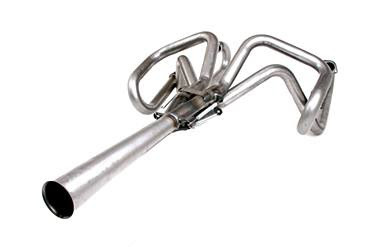 What was on the car now was a selection of short individual header pipes, no collector, and no attempt at tuning. That would not do. It was, among other things, dangerous, and likely to cause a fire if run that way for an extended period of time (like a twenty lap race). On top of that, the sound level would exceed the allowable limits (yes Virginnia, there are limits on how loud a race cars exhaust can be). Even worse it was taking away potential horse power. Even with the larger engine we use in Formula First, we don’t have any spare power to give away. I had hoped that the “Tri Mil “ mid engine system I had previously obtained would work, but as I studied the zero roll set up I began to realize that it was not going to fit. Sometimes it is a curse to be able to see things in three dimensions. I didn’t even have to try it on to know it wasn’t going to fly. I was still hoping I would not have to shell another six to nine hundred bucks for a new header system. I knew that I could get a “Roxanne” system but that would be the price range, and it just didn’t fit my budget. I remembered that Gary had a Roxanne type system that he had obtained in one of his trades ( he does a lot of swapping around with parts and pieces). I called him and found out that since it had not fit his car he was about to cut it up to use for something else. I offered to trade him my Tri Mil set up for it. Since we had about the same amount of cash involved in each system it seemed like an equitable trade. There were was a race the following weekend and I took it over to the track with me for him to see. After he examined it he agreed to the swap and I was a happy camper. We set up a date for the next weekend to get together and see what would be required to fit it to the Caldwell. Rusty and I towed the Caldwell up to the Wizard’s on the appointed day. With the car unloaded we stared removing the old header pipes and trying to fit the Roxanne look a likes. They didn’t fit exactly either, but there was a subtle difference. It looked all we had to do was to extend each primary pipe three inches and everything would clear the zero roll bars. The collector was a flat four into one similar to the one we used on the Grinch.. The schedule glitch was that Gary had to go to Houston for the next two weeks to attend some company required seminars. They were not being held in New Orleans because of the conflict with Mardi Gras. The stretching of the exhaust system would have to wait for his return. Frank A. Lamb lived and raced in southern Louisiana. His brother Hugh Lamb and son Frank L. Lamb (Rusty) make up the core of the Blind Mule Racing Team. Son George prefers sailboats to race cars, but maintains the team's blog. Thanks to Bruce and Karen Hunninghake for the creation of the Blind Mule logo. And just when everything is going so good…..